Boris Johnson broke ministerial rules when he took on his Daily Telegraph column after quitting as foreign secretary, a watchdog says. The Advisory Committee on Business Appointments (Acoba) said Mr Johnson did not observe a minimum three-month waiting period for taking up new jobs. The watchdog said it was “unacceptable” Mr Johnson had not sought its advice before signing the contract. Labour accused Mr Johnson of showing “utter contempt” for democracy. Mr Johnson’s office has not responded to a request for a comment. The committee advises ex-ministers on taking new jobs after they quit. It does this based on rules aimed at avoiding the risk of a former minister “improperly exploiting privileged access to contacts in government” and the suspicion that a new job is “a reward for past favours”. In a letter to Mr Johnson, the committee quoted the ministerial code which says ministers must seek its advice about “any appointments or employment” they want to take on within two years after leaving office. “The committee considers it to be unacceptable that you signed a contract with The Telegraph and your appointment was announced before you had sought and obtained advice from the committee, as was incumbent on you leaving office under the government’s business appointment rules,” it said. It says Mr Johnson has agreed not to use “privileged information” in the role and says his contract should be amended to reflect this. Labour’s Shadow Cabinet Office Minister Jon Trickett said: “Boris Johnson’s flagrant breach of the rules shows the utter contempt he has for democracy and ridding politics of vested interests, and raises serious questions about why he was so desperate to start writing for the Telegraph again. His comments echo a report by a cross-party committee of MPs, in April, which described Acoba as “a toothless regulator which has failed to change the environment around business appointments”. The Public Administration and Constitutional Affairs committee called for urgent reform of the watchdog to improve public trust. 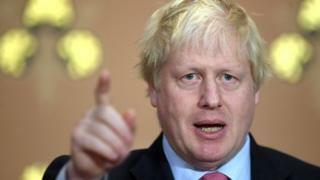 Mr Johnson resigned from the government over Prime Minister Theresa May’s Brexit policy on 9 July, signed the contract on 12 July and referred himself to the committee on 26 July, the letter says. The former London mayor has previously worked as a journalist, and earned almost £23,000 a month writing for the Daily Telegraph before being appointed as foreign secretary last year. His latest weekly Telegraph column has triggered a row over remarks he made about Muslim women wearing the burka.